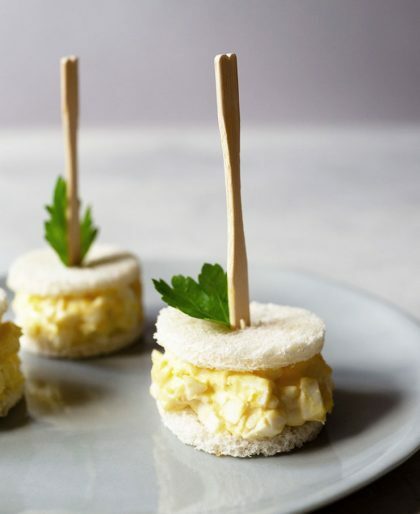 Tea sandwiches should be small and bite-sized–a dainty version of a regular sandwich. To be eaten in three bites, at most, and with your fingers, tea sandwiches are the first course served at every traditional afternoon tea. 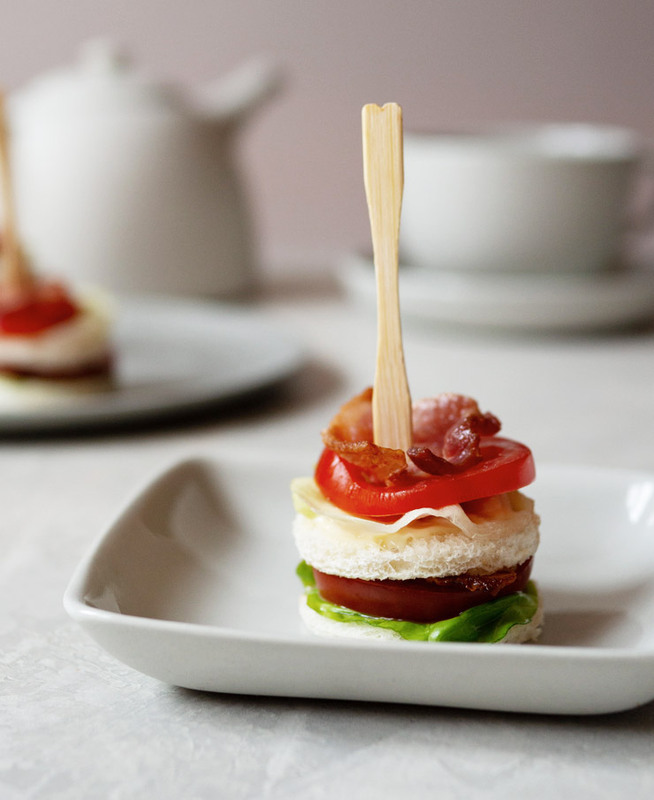 I made a mini version of the classic BLT (Bacon, Lettuce, Tomato) sandwich that would be perfect for afternoon tea. My BLT is double-stacked (just an excuse to get more bacon in there) and open faced. It’s all held together with a cocktail fork to keep things neat and tidy. You can serve it as a part of the savories course for afternoon tea at home or you can have it for a mid-day snack with a pot of tea. I would go with a black tea to pair with this BLT. The black tea is strong enough to complement the rich flavors of the bacon and mayo. Black tea like Earl Grey, English Breakfast, or Darjeeling would all pair really well. It’s what makes this sandwich soooo tasty, well, aside from the bacon. Having the set makes it easy for me to cut out the right size bread. Essential in holding everything together. Before cooking the bacon, I cut each strip into four pieces. There are two ways I like to make the bacon for this recipe. One is on the stovetop in a frying pan and the other is in the oven. There’s less mess with the oven method and the bacon will come out more uniformly shaped than if you cook in the frying pan, but the frying pan is much quicker and easier when you’re making just a couple of slices. To cook bacon in the oven, line a baking sheet with parchment paper and evenly place the cut bacon on it. Cook at 400°F for 15-18 minutes. This method is best for when you’re making multiple batches of this recipe. 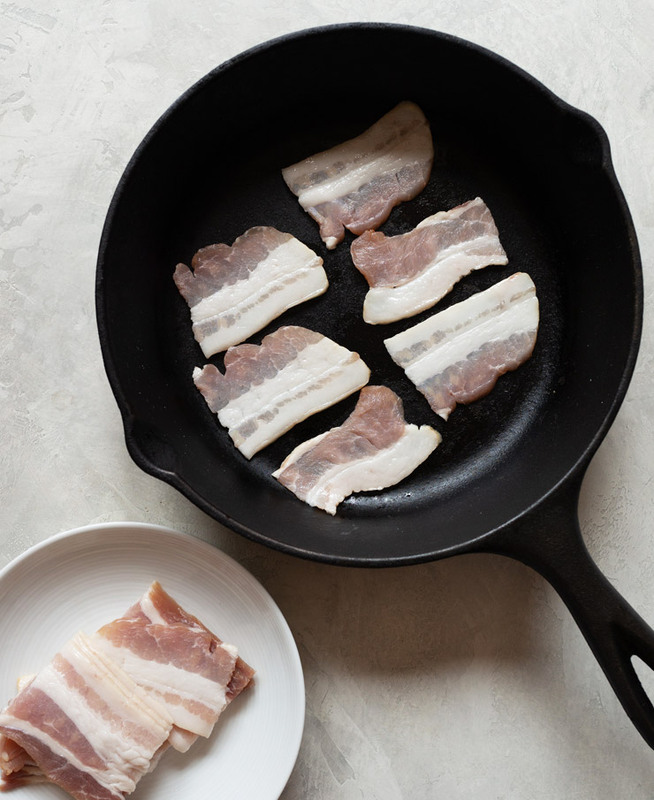 To cook on the stovetop, lay out the cut pieces of bacon in a frying pan and cook over medium heat, turning the bacon to cook both sides evenly. 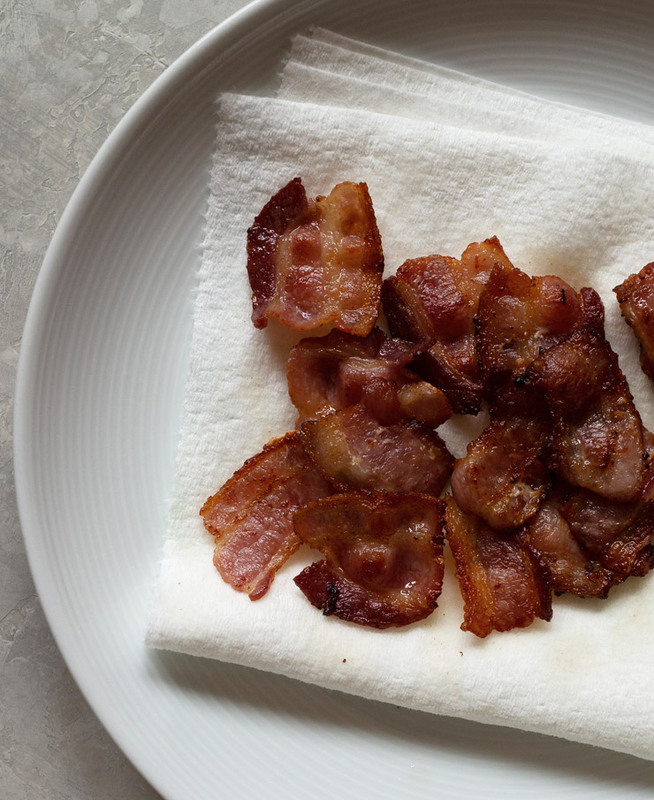 After the bacon is done in the frying pan, drain excess fat on a paper towel. The tea sandwich is meant to be eaten with your fingers, so remove any excess fat that can leave a residue. The size of your cocktail tomato will dictate how big your tea sandwich will be. 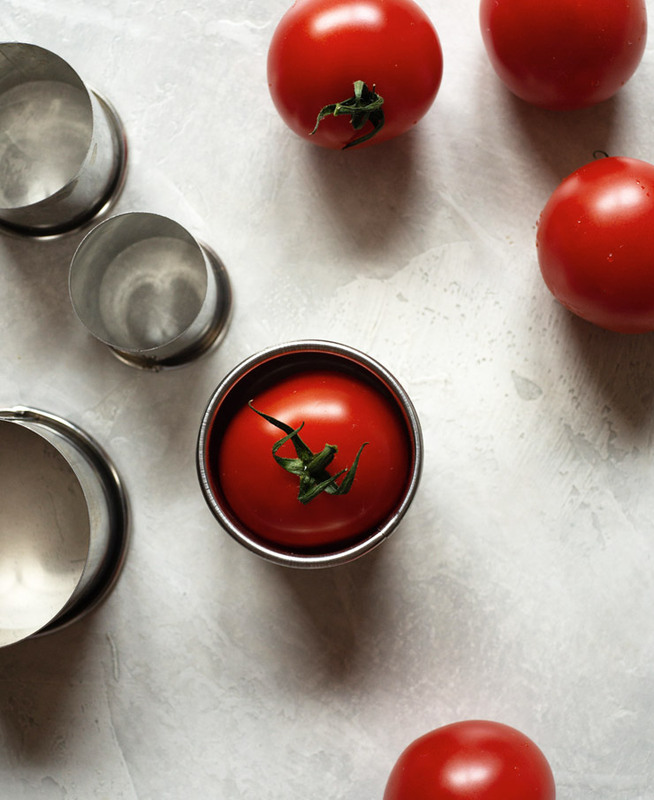 Find a round cookie cutter size that snugly fits a tomato inside. That cookie cutter will be the one we use for the bread and the lettuce. I like the round cookie cutter sets so you can work based on the size of the tomato instead of around the cookie cutter. 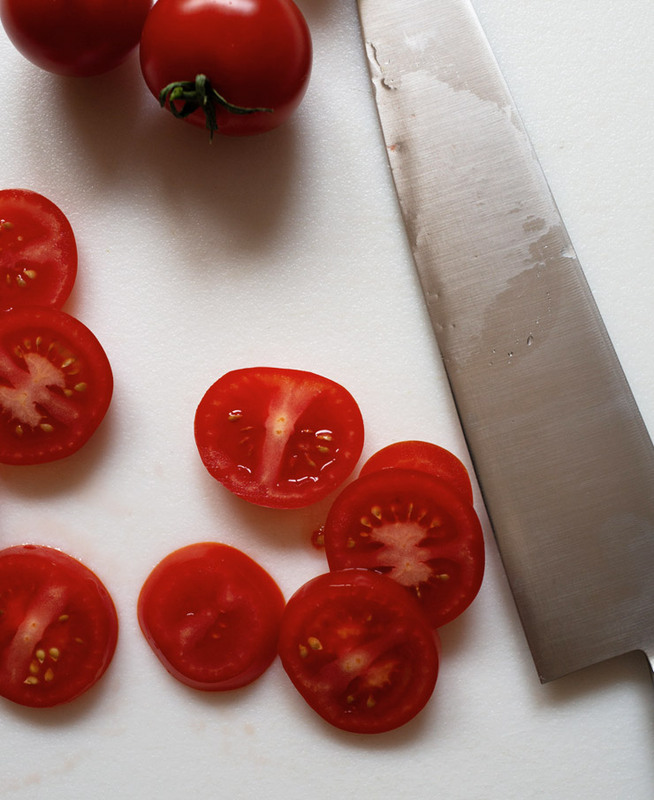 Cut the tomato slices to whatever thickness you prefer. I like them to be no bigger than 1/4″ so they look more delicate. Too thick of a slice and it’ll make the tea sandwich too tall since there are two slices of tomato in each tea sandwich. If your tomato is extra juicy, blot with a paper towel before assembling the tea sandwich. Using the same cookie cutter, cut out circles from the lettuce. I like using butter lettuce for this recipe since it’s softer and easier to work with, but you can easily swap it out for iceberg lettuce. When cutting out the lettuce, don’t stretch out the folds since they’ll spring right back and won’t give you that uniform look. Make sure the lettuce is completely dry before adding it to the tea sandwich. This BLT is double-stacked, so to make sure it’s not too tall, I used Pepperidge Farm’s Very Thin White Bread. This is the bread I use for making my tea sandwiches since it’s not as carb heavy as regular sliced bread. With the cookie cutter, I was able to get two circles out of each slice of bread. You can lightly toast the bread if you like, but I like to keep it as-is since I don’t want the bread to be dried out. I don’t like to throw out the leftover cut pieces of bread, so what I usually do is cut them into small pieces and toast them to add to salads as makeshift croutons. What makes my BLT special is not just the size but the mayonnaise I use. What’s so special about the mayo you ask? 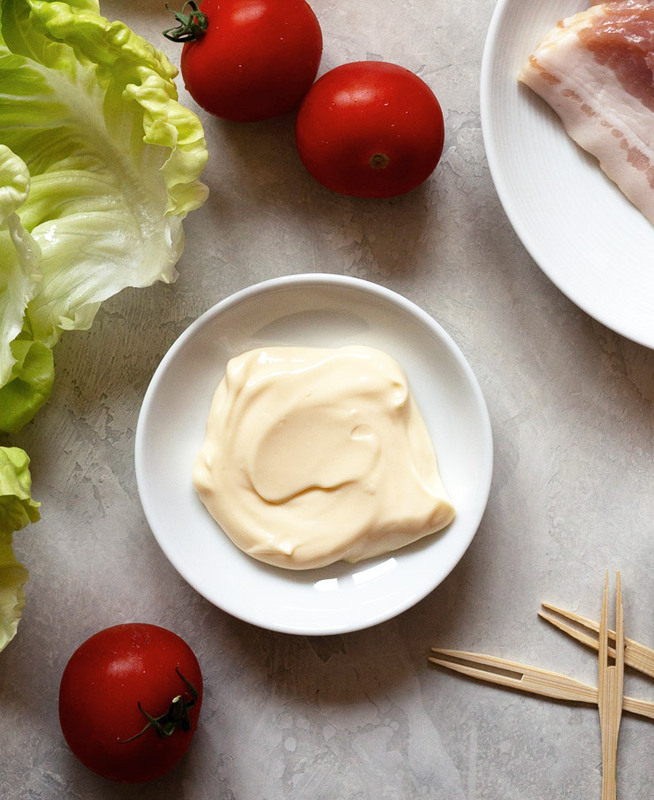 It’s Japanese mayo! It’s creamy, smooth, tangy, and I think it’s WAY better than regular mayo. 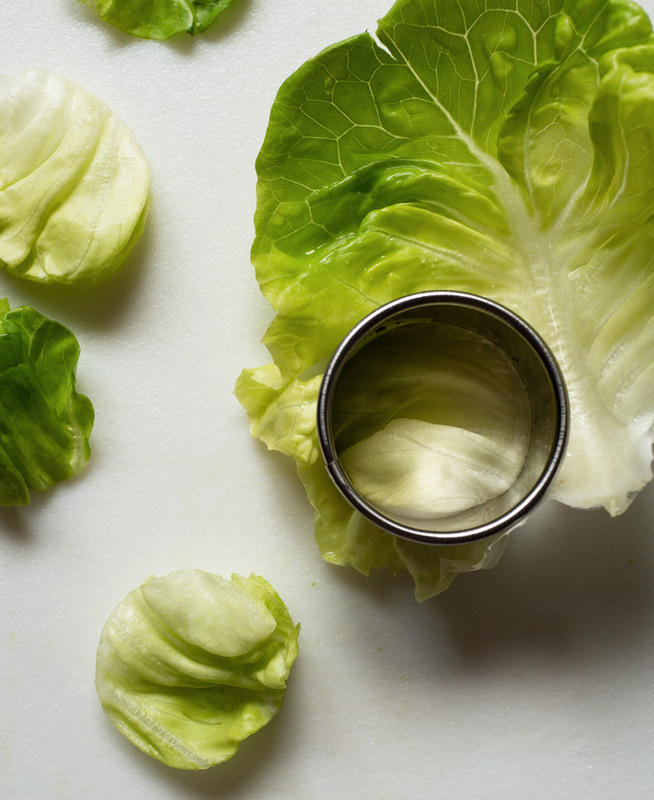 As my go-to mayo (if there is such a thing) it’s the only one that goes into my sandwiches and egg salads. You know the mayo they use at sushi restaurants to top your dragon roll? This is it. Once all the individual parts of the sandwich are ready to go, it’s time to assemble! Start with the bread and spread a thin layer of mayo. Top with lettuce, tomato, and bacon in that order. 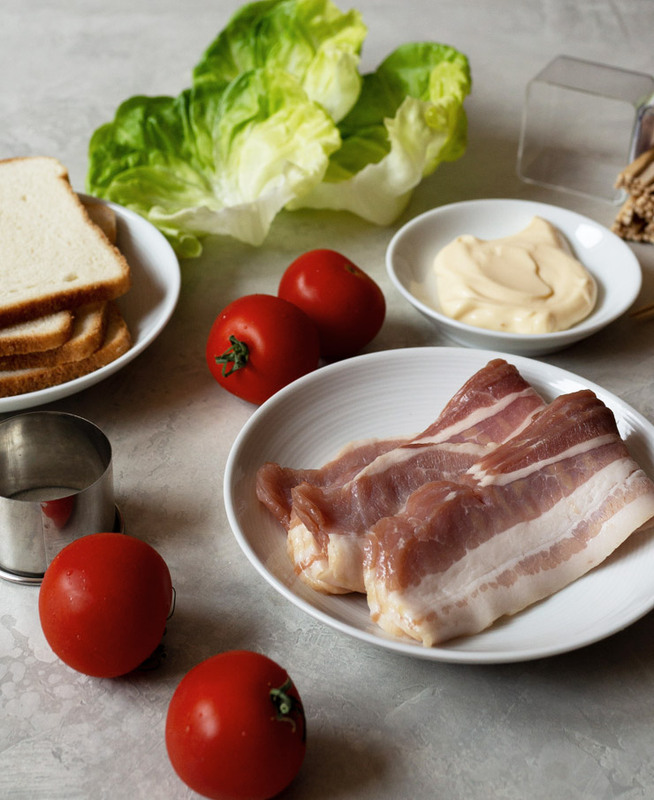 Take another piece of bread with mayo and layer it on top of the bacon, then add the lettuce, tomato, and bacon. The tea sandwich is open faced so no need for another piece of bread on top. 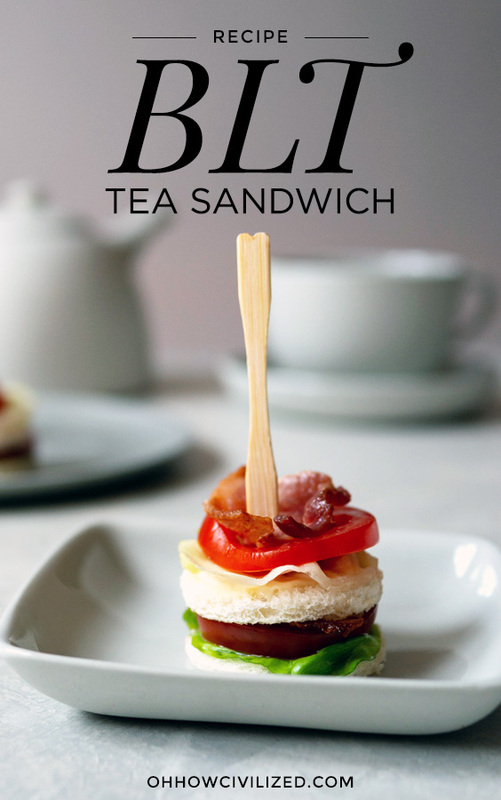 Get a cocktail fork and skewer the tea sandwich so that everything is held together. I use the mayo and lettuce as barriers to keep the bread from getting soggy. Everything can be cut and made a couple of hours before serving. Assemble close to serving time for optimal freshness. 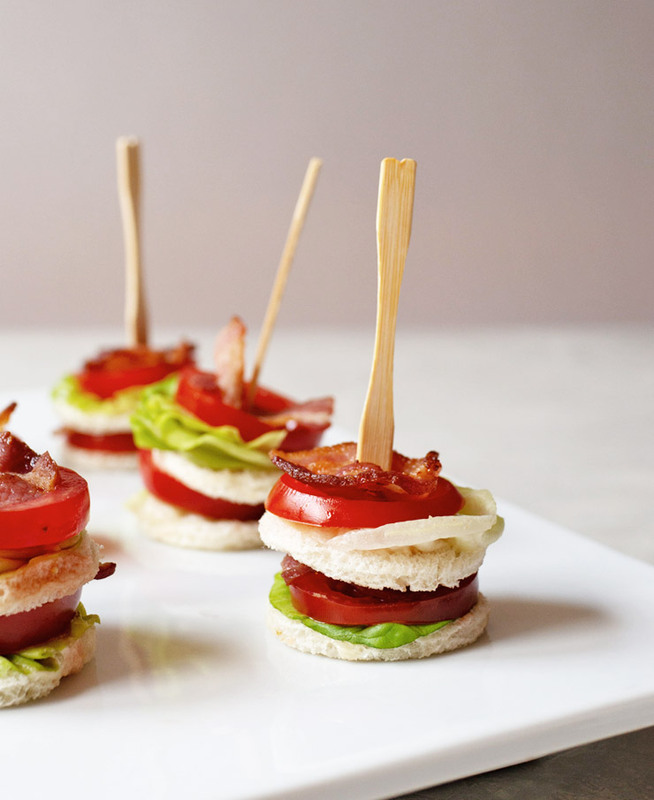 An adorable mini version of a bacon, lettuce, and tomato (BLT) sandwich. Cut bacon slices into four pieces and cook in frying pan or in oven until crispy then drain on paper towels. Get a cookie cutter that will fit a cocktail tomato snugly inside. 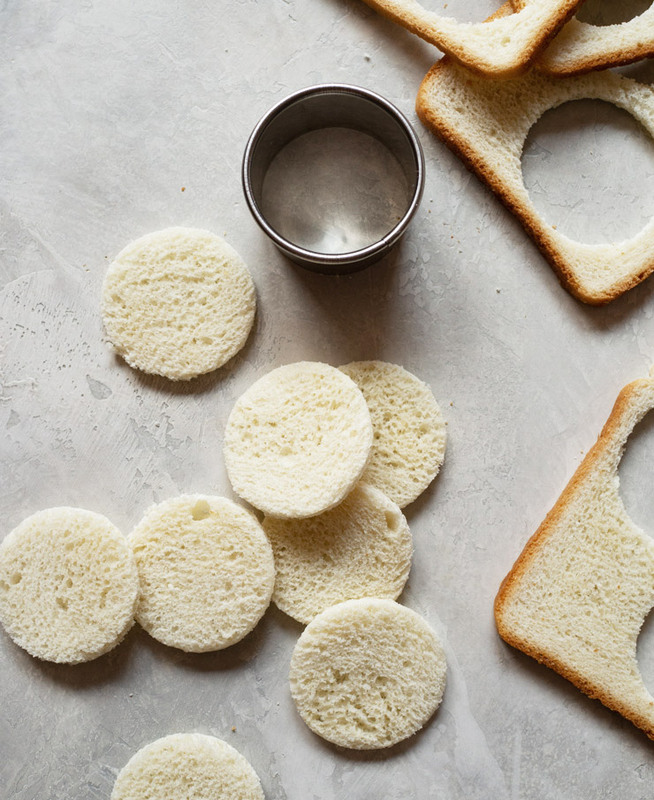 Use the cookie cutter to cut circles out of the lettuce and the bread. Slice tomatoes to no more than 1/4" thick. Blot tomatoes with a paper towel. Spread a thin layer of mayo on the bread and start assembling the tea sandwich. Layer bread with lettuce, tomato, bacon. Then repeat: bread with mayo, lettuce, tomato, and bacon to create the second layer. You can use regular mayonnaise instead of the Japanese version. NOTE: This post was originally published in 2013 has been updated on August 2018. I recently read a recipe at Food and Wine about an MLT. M = mushroom, specifically king oyster, but the recipe said shiitake would work, too. I was hesitant to make because not sure the under-10 would eat the L and T but your presentation has re-inspired me. Thanks! Hi Lori, I think you're kids will like these small tasty savories! Hi Georgia, there's very little L, and if you cut the T thinner, maybe your kids will try them. I think they'll like the bite-sized aspect to them! How adorable and tasty do they look! I love bacon, so I will try these for sure. For the 4th, I made bacon wrapped corn on the cob, and it was so good. Thanks, Winnie! Ooh, bacon wrapped corn sounds delicious! I love a good BLT, this looks delicious! Thanks, Nik, it was delicious! Hi Ashley, I would wait as long as you can to assemble them, but they can probably be made a couple of hours before serving. I worry about the lettuce losing its crispness. If you do make them earlier, I would keep them in the fridge, but make sure to take it out so it gets to room temperature since you don't want to serve it cold. 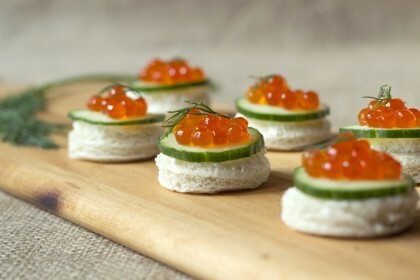 I think these are so cute and would love to do something like this for my wedding reception. I'm more worried about the bread getting soggy than the lettuce. Thoughts anyone? Hi Muriel, as long as you blot to dry the lettuce, the bread shouldn't get soggy. Congrats on your upcoming wedding! I worry the tomatoes will make the bread soggy if you make them hours in advance. Hi Vee, I like to prepare and make all the separate parts of the BLT beforehand and assemble them 1-2 hours before they’re to be served to keep the bread from getting soggy. 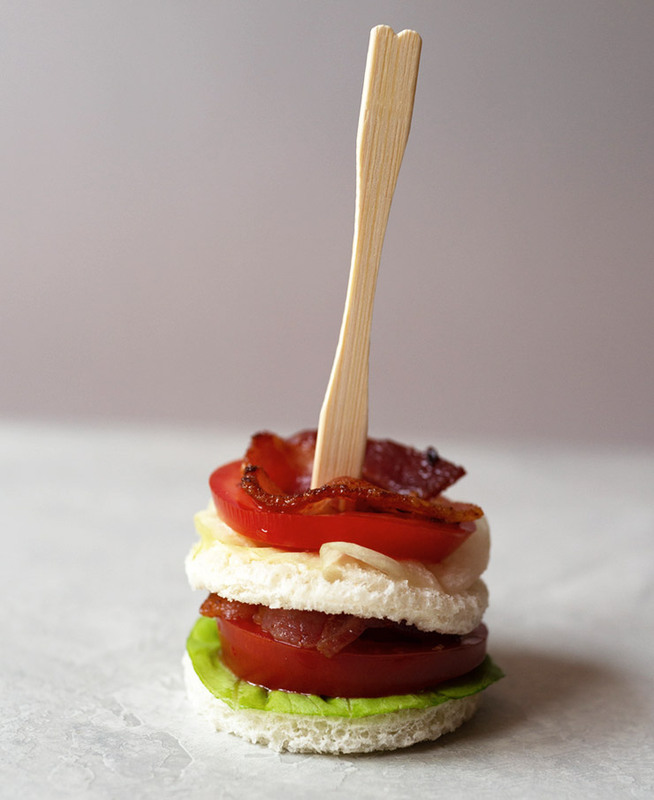 This is the first time I’ve been to this blog, but I make mini open-faced BLTs for all my tea parties. They are amazing on pumpernickel with chipotle mayo. 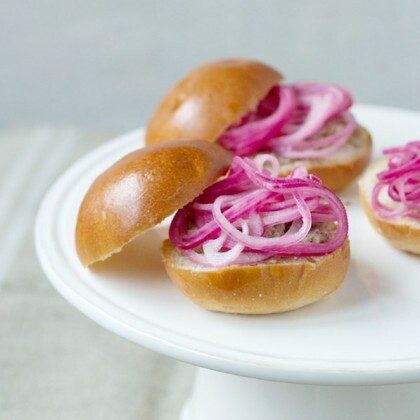 Hi Reenas-as, ooh, pumpernickel and chipotle mayo sounds delicious!